Findings that a one-time oral treatment to cure yaws, a neglected tropical disease, is as effective as the currently recommended penicillin injection have prompted the World Health Organization (WHO) to convene a meeting on how the disease may be wiped out. 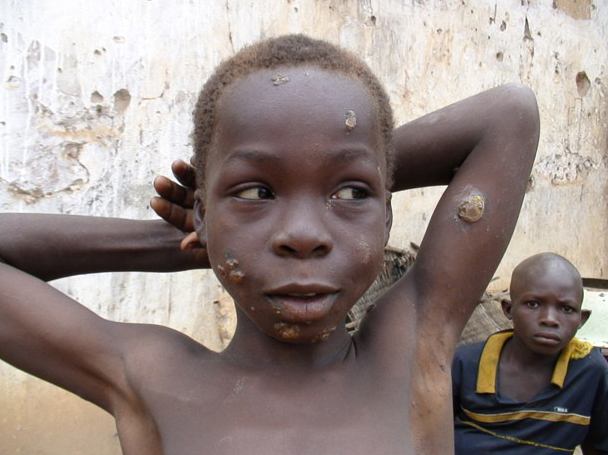 "We may be closer now than we have been in decades," Kingsley Asiedu, a yaws expert with WHO's Department of Neglected Tropical Disease Control, told IRIN, calling the study on the bacterial skin disease, which leads to chronic disfiguration and disability in 10 percent of untreated cases, the most significant in half a century. After a UN-led worldwide control programme cut infections from 50 million to 2.5 million in 1964 in 46 countries, the disease re-emerged in the 1970s when control efforts lagged, affecting an estimated 460,000 people - mostly children - in poor, tropical rural areas mainly in Africa and Asia, according to the most recent figures reported to WHO in 1995. In 2010, the Lihir Medical Centre in Papua New Guinea (PNG), where the disease is still endemic, gave the one-time oral dose of the antibiotic azithromycin to about half of 250 infants and children from six months to 15 years infected with yaws. Follow-up exams in 2011 showed the treatment was as effective as penicillin injections, which - unlike oral antibiotics - require trained health staff and equipment often scarce in areas most in need of treatment, wrote the researchers. In a recent index of health workers' outreach by the NGO Save the Children, PNG ranked in the bottom 20 of 161 surveyed countries. The meeting of yaws experts convened by WHO in Geneva from 5-7 March will "fully define how we are going to embark [on a new yaws treatment regimen] using azithromycin", said Asiedu. WHO's yaws treatment guidelines date back to the 1960s and there have been no alternatives since, he added. In Southeast Asia, WHO set the goal for regional eradication by 2012 in two remaining endemic countries - Indonesia and Timor-Leste. PNG, the Solomon Islands and Vanuatu have also reported cases. Sub-Saharan Africa was the most heavily affected based on earlier estimates, but the "picture is not entirely clear now", said Asiedu. Cameroon, Central African Republic, Congo, Côte d'Ivoire, Democratic Republic of Congo, Ghana, Sierra Leone and Togo have all reported cases. More studies are needed to ensure resistance to azithromycin treatment does not develop, said David Mabey from the London School of Hygiene and Tropical Medicine. While penicillin "has stood the test of time" - still as effective fighting the bacteria causing yaws after roughly 60 years - he noted mass azithromycin had only been used in developing countries for about a decade to treat trachoma, another bacterial disease prevalent in poor rural areas. Discussions at the upcoming WHO meeting will include a measure to monitor antibiotic resistance, said Asiedu. "Antibiotic resistance is a risk in any treatment and we always have to be vigilant."